HydroComp was asked to review a 90 ft (27 m) patrol boat design for an engine manufacturer. Initial predictions by the boat designer indicated that the boat would not make the target speed, and they were asking the engine builder to suggest a higher powered engine model. The engine builder felt that the installed power should have been adequate (based on similar installations), and asked HydroComp to provide an analysis of the design and the suitability of the waterjet. Using NavCad and information about the vessel geometry and loading, as well as specifications for the engine, gear ratio and waterjet the total resistance was predicted and the propulsion power determined with the waterjet. Our analysis confirmed the suspicions of the designer – the boat would not make the intended speed. As a regular step in our prediction of drag for almost any project, we use NavCad to perform a “Drag Reduction” analysis. 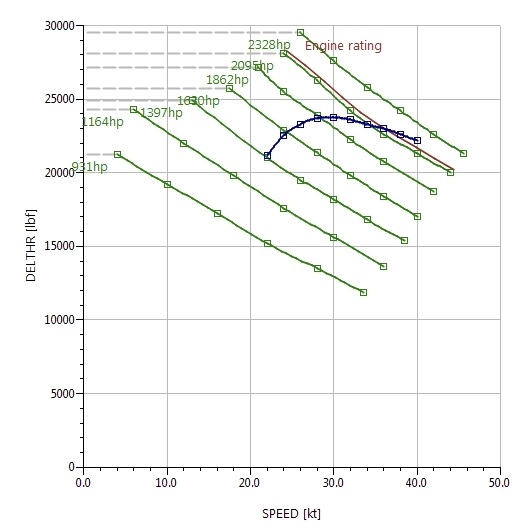 This analysis allows us to see how a change in a vessel parameter affects drag. It gives us a way to find improvements to the hull form. We set up a range of these three parameters to investigate. The resulting evaluation indicated that a very significant reduction in resistance could be found (potentially more than 20%!) by reducing the maximum sectional area, shifting the longitudinal center of buoyancy, and increasing transom immersion. One important benefit of NavCad’s integrated approach to evaluating waterjet performance on a vessel – as opposed to a simple thrust-drag plot – is that it allows you to see equilibrium RPM and propulsor efficiency at each speed. The waterjet initially selected for this application is capable of higher efficiency, but only at higher speeds. In other words, this waterjet model was probably designed for operation at 40 knots, and is unsuitable in the 20-23 knot target speed range. The use of another waterjet model – one that was designed for the lower speed range – will very likely allow the vessel to reach speed without a change in hull form or engine. The traditional graphical approach to matching a waterjet to a vessel is clearly obsolete. For the design described in this case study, the graphical approach would have indicated an 18 knot operating speed with the installed engine, gear and waterjet. The solution to increasing speed to the target 23 knots was to have been an increase in engine power of some 20% or more. Unlike the graphical approach, a physics-based solution, like that described here using NavCad, offered significant advantages to all parties involved – the designer, waterjet and engine manufacturers, and certainly the owner/operator. The most cost-effective action was for the designer to modify the hull design with characteristics that reduced drag over the speed range (such as greater immersed transom) and to select a more appropriate sized waterjet for this application.